Marine and Marina flew back to France on August 10, and a few hours after the take-off they were already touching the Parisian tarmac… When on our side, at this hour, the day had hardly come to start: we were still in Zagreb and most probably having breakfast in a park. The advantage when you travel by bicycle is that you never have your time of departure printed on a ticket! We then walked in downtown Zagreb, which left us completely indifferent. Zagreb is not the most charming capital of the World, and even less when it is anaesthetized by the typically European Sunday sleepiness. So on August 10, we also started our journey back to France. Obviously, we were not going to find our native land within a few hours. But within a few hours, we found Slovenia ! It was not the first time that we heard such a foolish political story. Actually no need to travel to hear them. And yet, during this year, what we saw and experienced the most are doubtlessly kindness and generosity. The question is naive, but why are our representatives unable to embody these qualities? Can’t anyone gain power without losing himself in the process? It seems that the most beautiful changes will not fall from the sky… but that they will instead sprout out of the ground! Fortunately this aside was only a single drop in these two joyful hours. Thank you Dragana! 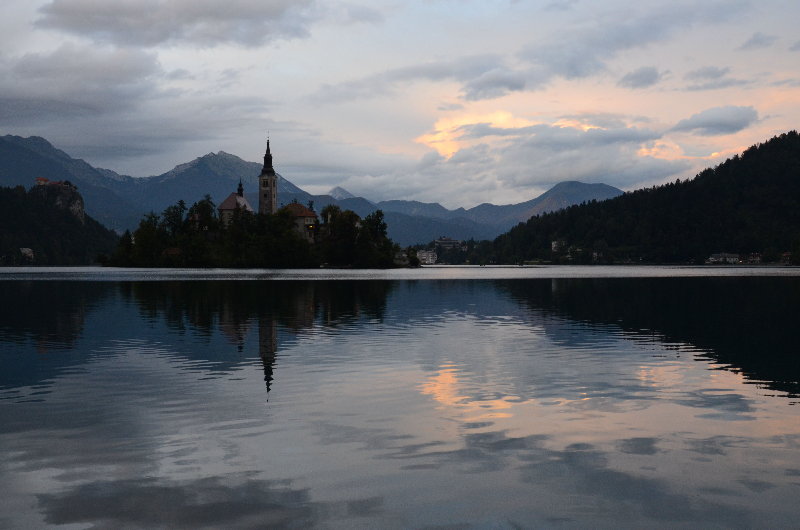 In two days, we crossed half of the country and arrived in Ljubljana. Sure, it can look impressive. But everything is relative you know, we had time to train during this past year. 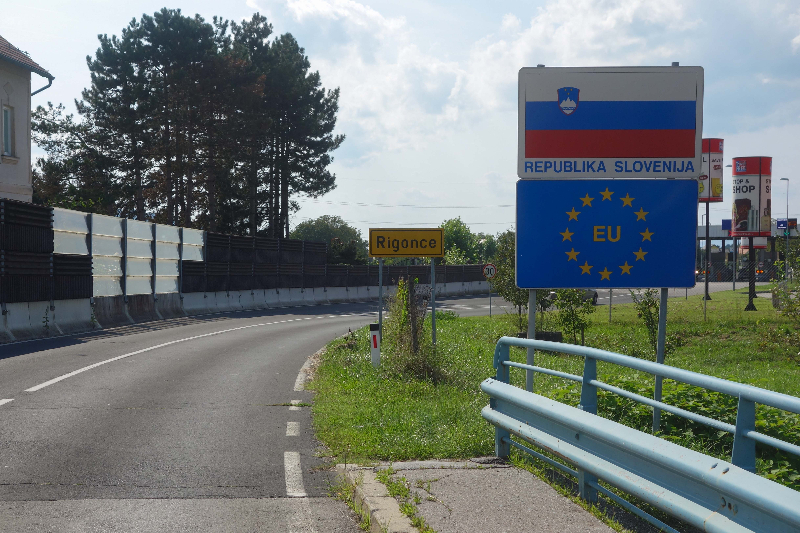 And also we should say that Slovenia is 30 times as small as France… This “half of a country” was in fact only 150km! 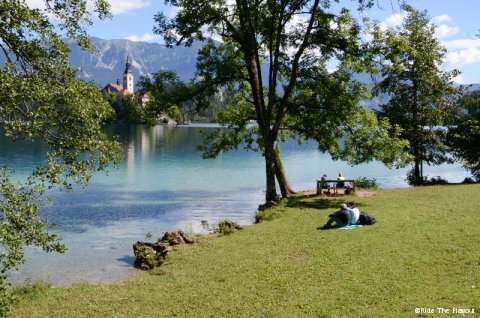 🙂 Moreover, the same relation applies to the population: the Sloveniens are only 2 million and Ljubljana has only 280.000 inhabitants. Never the arrival in a capital had not been so fast: 1/2h away from of the center, we were still surrounded by corn fields! 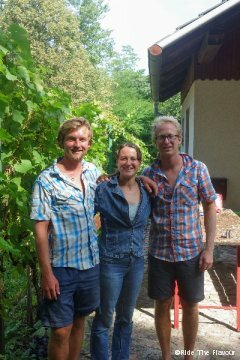 Nejc (who we had contacted via warmshowers) hosted us during 4 days in Ljubljana. We have explored downtown Ljubljana (lovely and very alive), met his flatmates Ira, Laura and Bianca, and spent some good evenings together… These four days were often rainy, but one morning the clouds had disappear and we could go back on track towards North. Towards Bled! We forgot the traditional photo, but many thanks to you all for your welcoming! 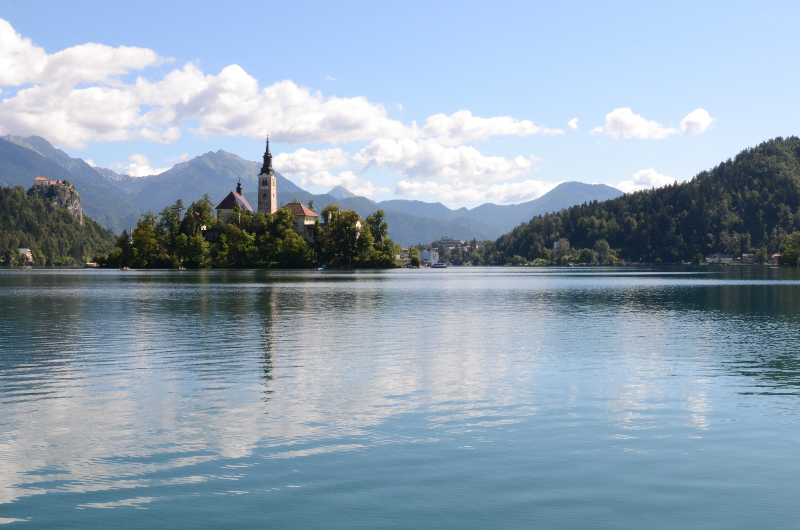 Lake Bled marked the beginning of a long series of lakes and swimming. A long series which goes on in Austria! 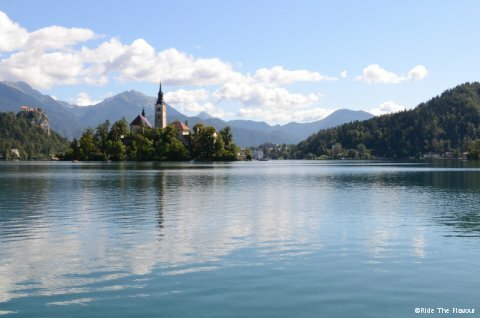 The beautiful Bled and your wonderful photos! Congratulations for your true story and very good presentation, not only for Slovenia but Serbia, Croatia and Bosnia as well. Amazing how you manage your whole trip!